The U.S. National Snow and Ice Data Center yesterday updated status of Arctic ice coverage (http://nsidc.org/arcticseaicenews/2009/040609.html) with the report that at the end of March the extent of ice coverage was similar to recent years, but below the longer-term 1979 - 2000 year average (peak coverage had been reached by February 28). Most significantly, NSIC also reported that the percentage of younger, thinner and thus more vulnerable ice continued to increase. The average extent of March sea ice was 5.85 square miles (15.16 sq. kilometers), which was 228,000 sq. mi. (590,000 sq. km.) below the 1979 to 2000 average, but above the all-time low observed in 2006. As the darker colored surface of open water absorbs more energy that the lighter colored, more reflective ice surface, the extent of sea ice is an important factor in determining the ocean temperature. 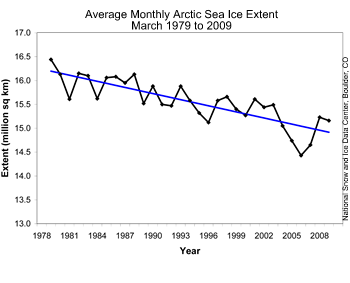 Since Arctic ice is floating on the sea, melting will not effect ocean levels. However, a warming Arctic sea would increase the melting of terrestrial ice, especially on Greenland, which would increase world-wide ocean levels. Additionally, a warming Arctic sea would transfer heat to the atmosphere and alter ocean currents thus hastening global climate change. As the extent of spring ice coverage continues to decline the probability of these impacts increases. Sea ice thickness is important, as thinner ice is more likely to melt during the summer, and is more vulnerable to being fractured by wind. 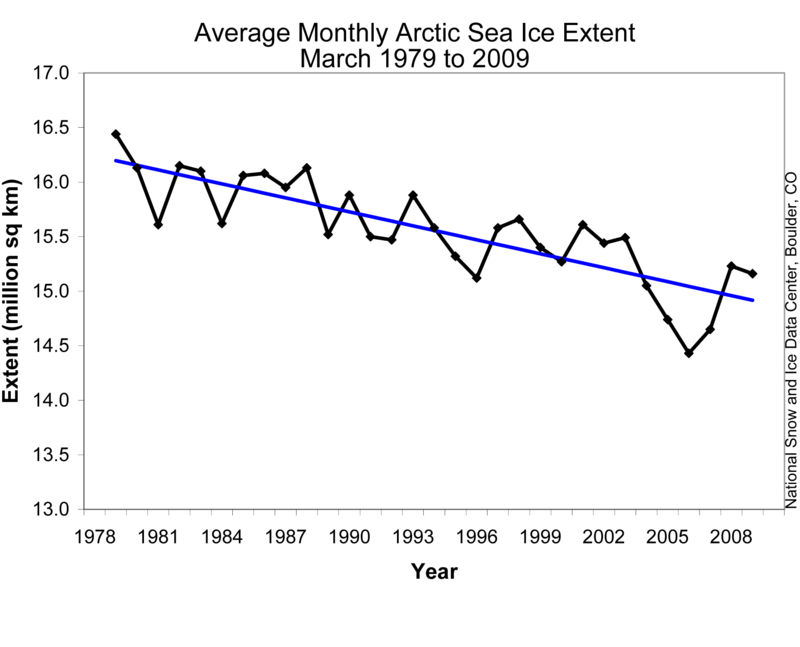 In the past, the majority of Arctic ice survived year-round. However in recent years, an increasing amount of ice has melted during the warmer summer months, or fractured and blown out of the Arctic sea by wind. Consequently the extent of ice coverage during the summer has declined and warming of the Arctic sea, and air temperatures of the region, have increased. Historically, the majority of Arctic ice has been old, or multi-year ice. This year the amount of ice older than 2 years was less than 10% of the ice coverage at the end of February. The figure below shows that the older ice is concentrated along Canada and Greenland (land masses are gray) with the young ice found toward Russia. 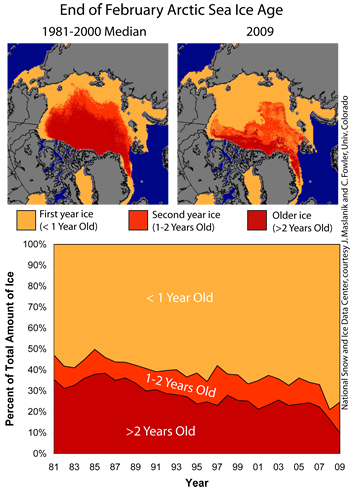 These images show declining sea ice age, which indicates a thinning Arctic sea ice cover more vulnerable to melting in summer. Ice older than two years now accounts for less than 10% of the ice cover. Many scientist are expressing concerns that these findings demonstrate that global warming is proceeding much more rapidly than previously projected and that the Arctic sea may be completely ice free during the summer within 5 to 10 years.